BLUE RIDGE, Ga. – Attorney James Balli, of the Marietta law firm of Sams, Larkin, Huff & Balli, was appointed Tuesday, Jan. 9, to replace David Syfan as city attorney during the first Blue Ridge City Council of the new year and administration. Balli’s appointment was approved by the council four to one with incumbent Post 1 Council Member Harold Herndon voting against the appointment. 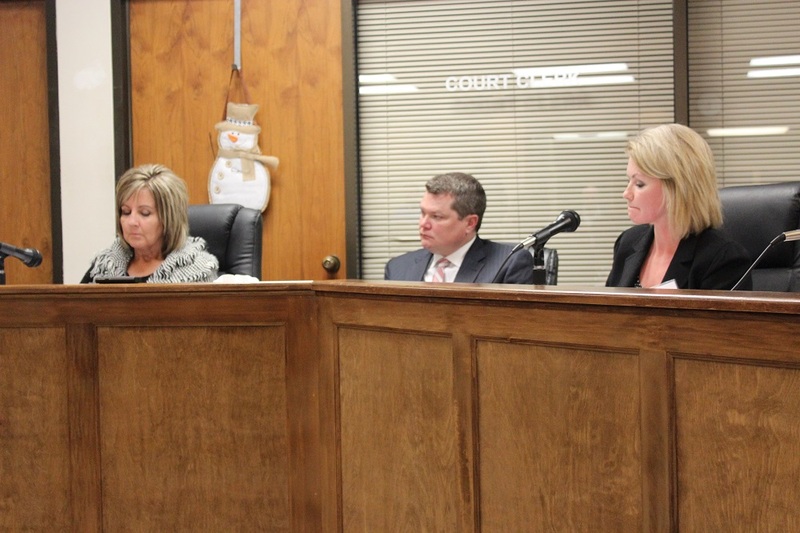 Mayor Donna Whitener also explained Balli’s rate would be $175 an hour with no retainer fee, and only four applications for the position were received by the city. 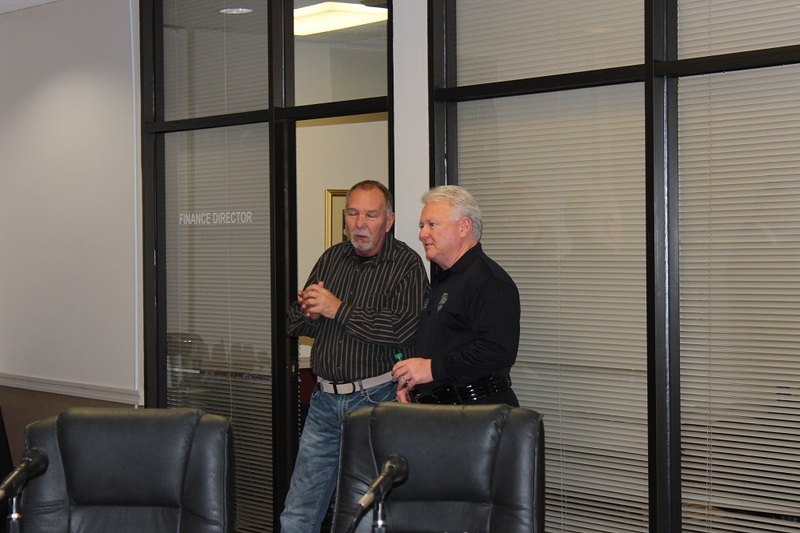 Interim Blue Ridge Police Chief Johnny Scearce, right, speaks with local resident prior to Tuesday’s city council meeting. When Whitener asked if it was possible to have a vacancy, Balli stated he did not recommend this. After this, newly appointed Post 3 Council Member Kenneth Gaddis made a motion for Scearce to serve as interim police chief until the mayor and council are able to find a permanent police chief. After a second from new Post 5 Council Member Nathan Fitts, the council voted unanimously to approve the transition. The two moves followed the oaths of office from incumbents Mayor Whitener and Council Members Herndon and Rhonda Thomas-Haight as well as incoming Council Members Gaddis, Fitts and Robbie Cornelius. Thomas-Haight was also voted to serve as mayor pro tempore of Blue Ridge. Other appointments included Kelsey Ledford and Alicia Stewart remaining as city clerk and city treasurer, respectively, Robert Sneed as municipal court judge, Joseph Hudson as prosecuting attorney of court appointments and Welch, Walker & Associates as the city’s designated auditor. 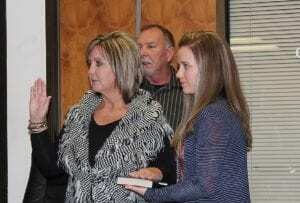 Blue Ridge Mayor Donna Whitener, left, takes the oath of office as her daughter, Kristen, holds the Bible. Local architect David Goodspeed was also approved to serve as interim building inspector for the city’s Zoning and Land Development department. Thomas-Haight stated in her motion that Goodspeed would serve the city on a limited basis, working between 12 to 16 hours a week on average at the rate of $100 an hour. Continue to follow this story on FetchYourNews as more details and the video from the meeting are made available. If the council decides to replace the chief of police it will be a disgrace.